Ahead of DAZN’s US launch, the live and on-demand sports streaming platform announced it will make Amir Khan vs. Samuel Vargas available for free on Facebook and Twitter. The Matchroom Boxing fight card will air live on Saturday, Sept. 8 from Arena Birmingham in the U.K. with the main event beginning at approximately 5 p.m. ET. The fights will appear on the @DAZNUSA Facebook page and via the @DAZN_USA Twitter handle, and fans won’t need to be signed up for DAZN to watch the fight. Former unified light welterweight world champion Khan (32-4, 20 KOs), back in action following his knockout of Phil Lo Greco in just 39 seconds, will take on Colombian-Canadian contender Samuel Vargas (29-3, 14 KOs) in the 12-round welterweight main event. The Facebook and Twitter streams will begin at approximately 3 p.m. ET, featuring the Jason Welborn vs. Tommy Langford rematch following Welborn’s snatching of the British Middleweight title from Langford via split decision in May, as well as the junior middleweight tilt Ryan Kelly vs. Kelcie Ball. DAZN’s stacked fall lineup of exclusive fights features Anthony Joshua vs. Alexander Povetkin on Sept. 22, Bellator 206 on Sept. 29, Jessie Vargas vs. Thomas Dulorme on Oct. 6, Billy Joe Saunders vs. Demetrius Andrade on Oct. 20, among many others. Fans can sign up for DAZN by registering at DAZN.com or by downloading the DAZN app on a wide range of connected devices, including smart TVs, PCs, smartphones, tablets and game consoles, when the service goes live on Sept. 10. Speaking from his Los Angeles training camp, the former unified Super-Lightweight ruler insisted he will need to beat Canadian based Columbian Vargas in style if he is to secure a shot at Welterweight World honours later this year. “Fans will see another explosive performance on September 8,” said Khan. “I didn’t get a chance to show everyone what I had been working on during my time out against Lo Greco. But you saw the punch power, accuracy, speed and timing and you’ll see it again against Vargas. I always make it exciting, it’s going to be another big bang. Khan’s clash with Vargas tops a packed card in the second city, as Jason Welborn defends his British Middleweight title in a rematch with Tommy Langford, whom he snatched the title from in May via split decision in Walsall. Ryan Kelly defends the Midlands Area Super-Welterweight title he won in May via stoppage at Villa park against unbeaten Dordon man Kelcie Ball, Stourbridge banger Sam Eggington appears on the bill with Super-Bantamweight star Gamal Yafai, while Geordie Lightweight ace Lewis Ritson keeps busy ahead of his return to the Metro Radio Arena on October 13. Preston Super-Welterweight Scott Fitzgerald takes on Ludlow’s Craig Morris over ten, Leeds Super-Bantamweight Qais Ashfaq faces Southampton’s Ricky Little, with action elsewhere from Northampton Middleweight Keiron Conway, Bolton Super-Bantamweight Osman Aslam, Birmingham Cruiserweight Shakan Pitters and Birmingham Super-Welterweight Mussab Abubaker. 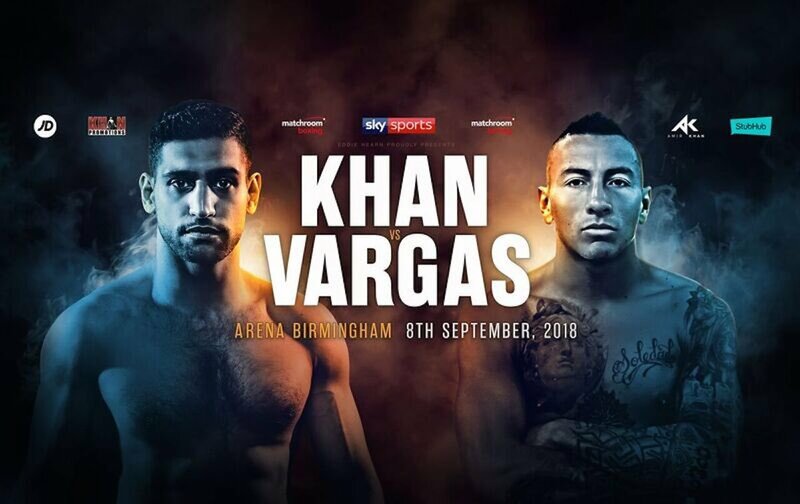 Amir Khan will face Samuel Vargas at Arena Birmingham on September 8, live on Sky Sports with the hotly anticipated Jason Welborn versus Tommy Langford Chief Support. Welborn defends his British Middleweight title in a rematch with Tommy Langford, whom he snatched the title from in May via split decision in Walsall on BCB Promotions ‘Neutral Ground’ Show. Bill topper Khan is back in action following his blistering return to the ring in April in Liverpool, destroying Phil Lo Greco in just 39 seconds after nearly two years out of action. “One of my aims this year was to be as active as possible so I’m very happy to get back in the ring again so soon against Samuel Vargas,” said Khan. The undercard also sees Ryan Kelly defend the Midlands Area Super-Welterweight title he won in May via stoppage at Villa Park against unbeaten Dordon man Kelcie Ball, Stourbridge banger Sam Eggington and Super-Bantamweight star Gamal Yafai appear on the bill after boxing this coming Saturday, with more title fights and stars to be added. Tickets go on general sale at 1pm on Friday June 29 from www.arenabham.co.uk.